Upgrading the Pasley Street North entrance to Fawkner Park to improve landscape health, drainage, safety and amenity as part of the Master Plan recommendations. Fawkner Park is one of Melbourne’s most popular parks with recent research indicating approximately 9,000 people enjoy the park on a daily basis. To ensure the park’s ongoing sustainability and health, City of Melbourne has endorsed a concept plan for a number of improvements at the entrance to Fawkner Park from Pasley Street North. The concept plan was informed by community engagement in November-December 2017 and endorsed by Council in March 2018. The upgrade of the entrance was a recommendation in the Fawkner Park Master Plan 2006. The proposed improvement works have been designed with consideration to the registered heritage values of Fawkner Park, acknowledging the increased community use in this location, to address the long-standing condition issues at the Pasley Street North entrance, and ensure a healthy, sustainable landscape to support the existing and future use of Fawkner Park. What are the major improvements? To enable the drainage and amenity improvements to occur, the well-used basketball court at the Pasley Street North entrance needs to be relocated as the court is contributing to the flooding issues in the area. This will be replaced with a gently sloped lawn swale and landscape improvements to facilitate better drainage and pedestrian and cyclist circulation. The basketball court will be relocated closer to the picnic and playground area. This will ensure that it will remain accessible to its current users while improving its integration with the play and picnic area. The improvements at the Pasley Street North entrance proposed in the concept plan are primarily to resolve long-standing drainage issues in the area, improve tree and landscape health, improve pedestrian and cyclist safety and improve the amenity of the park entrance. Slide the arrow to reveal a before and after look at the proposed improvement area. Was there any public or community consultation on the proposed Fawkner Park Pasley Street North Entrance Improvement works concept plan? What are the tree and landscape health issues in the area and how are they being addressed? What are the drainage issues in the area and how are they being addressed? Yes. Community engagement on the draft Fawkner Park Pasley Street North Entrance Improvement works concept plan occurred from Wednesday 29 November to Friday 22 December 2017. The community was invited to participate in the consultation through signage in the park, letter drop in the immediate areas, emails to stakeholders, and information was distributed through school newsletters. Feedback was provided through Participate Melbourne website submissions and on site discussion. The community engagement process included meetings with the local schools and local residents. There were also two opportunities for the community to meet Council officers in the park on Saturday 9 December 2017 (2 – 4pm) and Monday 11 December 2017 (3.15 – 6pm). Community feedback informed the final concept plan. A summary of all the community feedback and the final concept plan was endorsed by the Future Melbourne Committee (FMC) on 6 March 2018. The minutes and the report to FMC with a summary of the community feedback are available on the City of Melbourne website (under Council meetings) and Participate Melbourne website (for project information). Tree and landscape health issues include trees in poor condition, poor lawn coverage and failing garden beds. This is contributed to by the drainage issues and high levels of ground compaction as a result of the number of children from the adjacent school using the area. A recent soil and tree health analysis has identified that there are improvements that can be made in the area to reduce compaction and improve the overall health of trees and the landscape. renovating the existing lawn affected by the water main renewal. Drainage problems often lead to water pooling in the area. These problems are caused by a combination of the topography, the capacity of the drainage systems both within the park and downstream (in the road), the compacted soil, and the location of the basketball court. Currently when it rains, the park is unable to soak the water (to reduce the flow) because of the compaction. The water comes down the path, collecting mulch along the way and is contained on the basketball court as it acts as a dam. The mulch contributes to the poor function of the drains. A recent investigation into drainage led to installation of two extra pits in 2016. However this has not resolved the flooding problem as there is insufficient capacity in the drains further along the system in Pasley Street. This ‘bottleneck’ further contributes to the current water pooling problem. Advice was sought on options to increase the capacity in the street versus finding a park solution. The cost to upgrade drainage in the street would be high and there is concern that the water would then add to problems further downstream. Finding a solution within the park, where water can be used for the landscape health is sustainable and preferable. 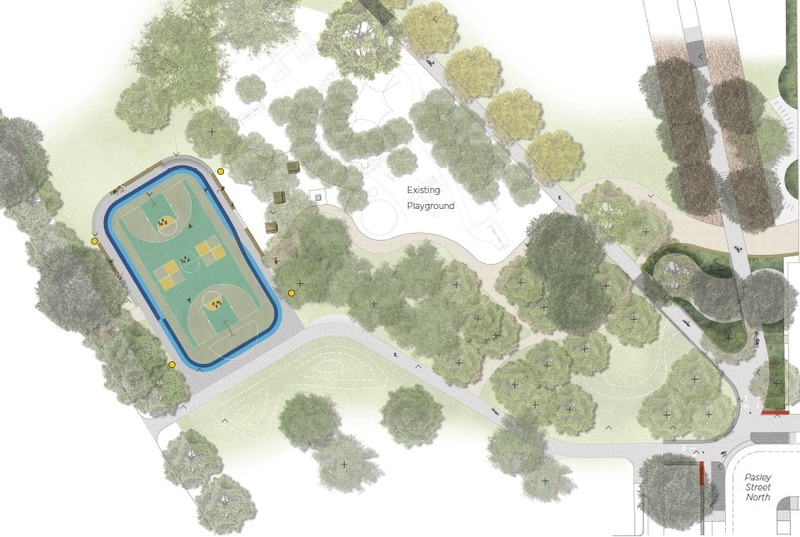 In the Fawkner Park Master Plan, the basketball court is shown as remaining on the corner of Pasley Street North. Why is the basketball court being relocated now? At the time of the Master Plan it was not envisaged that the basketball court needed to be relocated at the Pasley Street North entrance. However during the drainage investigation into the flooding problem in this area it was shown that the basketball court with its hard surface and the surrounding paving contributes to the local area flooding in this area. It needs to be relocated to resolve the problem. Why is the basketball court being moved? Drainage problems often lead to water pooling in the area, as the basketball court acts as a dam. These problems are caused by a combination of the topography, the capacity of the drainage systems both within the park and downstream (in the road), the compacted soil, and the location of the basketball court. Relocation of the sports court is necessary to resolve the drainage problem. We will create a gentle swale where water can be absorbed into the landscape. The new sports court location will be well integrated with the playground, and continue to be easily accessible by the school children, as well as the general public. This area would enable families to have children on playground equipment as well as children playing on or around the sports court, with a central gathering (and supervision) space. Is the sports court available for booking? The existing basketball court is a public park facility with a casual use focus and is not a bookable space. The new sports court will continue to have a casual use focus and will also not be a bookable space. Is lighting proposed for the new sports court? Consultation on the project asked about providing lighting (training not competition level) for the sports court. There were no major objections to this proposal. However, at this stage we are not intending to install lighting and it was not included as a proposal in the heritage permit application for the works. Should demand for lighting of the court occur in the future, this may be reconsidered. Any proposed lighting of the court would be at training level only and intended only to support informal and casual use of the court for limited hours up to 9.30pm in the evening. Will you provide a second basketball court to cater for high demand from the school? Community engagement on the draft concept plan for the Pasley Street entrance improvements was undertaken in November to December 2017. During the consultation, a number of people raised the growth of the school population and requested provision of an additional court. While we recognise there is demand for such a facility, the provision of any additional courts in Fawkner Park is a matter which would need to be reviewed as part of a Master Plan process. Will the works create more hard surfaces in the park? The existing basketball court and surrounding hard paved areas is about 830m2. There will be a small increase in the footprint of the new sports court, as it will have a small run off area around the court and netball rings for training use will be installed on the back of the basketball ring posts. This run off/edge is important for safe use of the court, but it will also allow for pedestrian access and will be used for play. The new court area is about 1000m2. Will the area be used by skateboarders? We anticipate the children may use the edges of the sports court for scooting and learning to skateboard. It will not hold any level of challenge for more experienced skateboarders. Why are we providing an additional path to the relocated court? Concerns have been raised about commuter cyclist use of the path adjacent to the playground and proximity to children at play. The use of this path has increased since the pedestrian crossing lights were installed on Punt Road in 2014. In addition to installing rumble strips on the path, it is proposed to construct a secondary path to encourage cyclists and pedestrians around the play area. This will bring cyclists to a path further from the children’s play area, as well as enabling pedestrians to access the sports court without entering the playground. It is anticipated the new design for the entry which introduces lawns and vegetation, and the narrow path, will assist with encouraging cyclists to slow down. What is happening at the Primary School entrance? The upgrade of existing path and introduction of two minor pedestrian paths will manage pedestrian access from the primary school. The paths will reduce the impact of the frequent pedestrian activity by protecting the tree roots, garden beds and lawns in the immediate area and to the play area. The path works along with soil amelioration will protect the heritage tree avenues and improve landscape health. Are the proposed works impacting the heritage values of Fawkner Park? Fawkner Park is historically significant as an outer ring park in the development of Melbourne and aesthetically significant as a fine example of a metropolitan park and its landscape character dominated by mature treed avenues. The proposed works do not impact on and are consistent with the cultural heritage significance of the place in relation to its status and use as a metropolitan park in Melbourne. The proposed works are to support existing park and recreation uses, recognise the substantial increases of use of the park, and manage existing landscape health and park drainage issues by the land management authority. The proposed works do not impact the cultural heritage significance of the place in relation to its landscape character. The design endeavours to nestle all elements into the existing landscape character where possible. Eleven young trees will be removed to facilitate the court relocation, and 21 new trees will be planted. The design of the entrance at Pasley Street North will make this entrance consistent with all other main entrances to Fawkner Park with a lawn area, garden beds and clearly defined paths, restoring the amenity at this location. 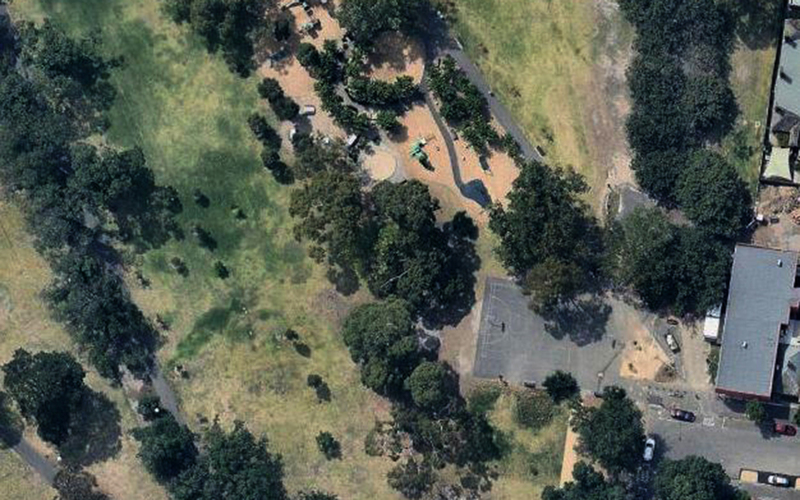 The relocation of the sports court in the lawn and in between tree avenues is consistent with the location of other informal and formal recreation activities in Fawkner Park. Particular care has been taken with the levels to ensure that the relocated sports court does not sit proud of the landscape and that there is a continuous view line at all directions without interruption by any fencing or large retaining walls. The surface material proposed for the sports court is a standard sports court surface which will support good levels of recreation use and manageable maintenance. The colouring and marking of the sports court surface will help define is as part of the play area and support multi-purpose use (for example including ‘down ball’ outlines). Garden beds will be introduced abutting the South Yarra Primary School building to improve the amenity, landscape and tree health and soften the impact of the school building which protrudes over the park. The garden beds will be low level shrub and perennial plantings consistent with the existing Toorak Road entrance garden beds in Fawkner Park near Christchurch Grammar School by using similar plant species. A new bio-retention garden bed is proposed at the corner of the Oak Avenue and playground path. It includes some rock work and bio-retention planting. The part of the bio-retention garden bed planting facing the entrance mirrors the garden bed planting proposed adjacent to school building to maintain a consistent aesthetic to the entry. It is set back under the existing trees so that it does not dominate the landscape in this area. It will also provide an element of playfulness and protect the existing landscape and trees from high levels of pedestrian activity. Park furniture and infrastructure including park wayfinding, interpretive and regulatory signage is proposed as part of the landscape works. This is consistent with the City of Melbourne standard suite of park furniture, infrastructure, signage and materials. Standard City of Melbourne park lighting is proposed for the new park path (from Pasley Street to the Elm avenue and east of the relocated court). This is consistent with existing park lighting provision for Fawkner Park for park use, access and safety.